A spirited and young Bengaluru FC side went down fighting 1-3 to Indonesian club Persipura Jayapura in their final Group E fixture of the AFC Cup at the Kanteerava Stadium, in Bengaluru, on Tuesday. Udanta Singh’s first goal for the club gave Bengaluru a 24th minute lead before an equaliser from Robertino Pugliara and second half goals from Imanuel Wanggai and Boaz Solossa ensured Persipura came out toppers from the group. Having already sealed a berth in the last-16 of the tournament, a blend of faith and precaution, given the Blues’ key League game against Salgaocar on Sunday, saw Ashley Westwood field a team that had Sunil Chhetri, Eugeneson Lyngdoh and Lalchhuanmawia on the bench while John Johnson, Joshua Walker, Sean Rooney and Rino Anto weren't part of the eighteen. Instead NS Manju, Keegan Pereira, Vishal Kumar and Gurtej Singh joined Curtis Osano in defence while Udanta partnered Robin ahead. Beikhokhei Beingaichho, Siam Hanghal and captain Shankar Sampingiraj in midfield completed the Blues’ starting XI. But despite coming up against a seasoned Persipura side, it was Bengaluru who hit confident notes right from the onset and reaped reward when Udanta latched on to a through ball by Robin Singh before unleashing past ’keeper Dede Sulaiman to give the Blues a lead they had earned. The Indonesian side, however, needed just five minutes to draw level through a smart strike from Pugliara. Lalthuammawia Ralte, who had done well to save Zulham Zamrun’s header in the 18th minute, could do little this time as the Argentinian picked his spot and slammed home from 25 yards out. Refusing to panic, the Blues kept their heads down, got about business and were unlucky to be denied by the crossbar a little before half-time. A long throw in from Vishal bounced in the box, eluding the mix before NS Manju’s header came off the woodwork as the first half ended with the score at 1-1. 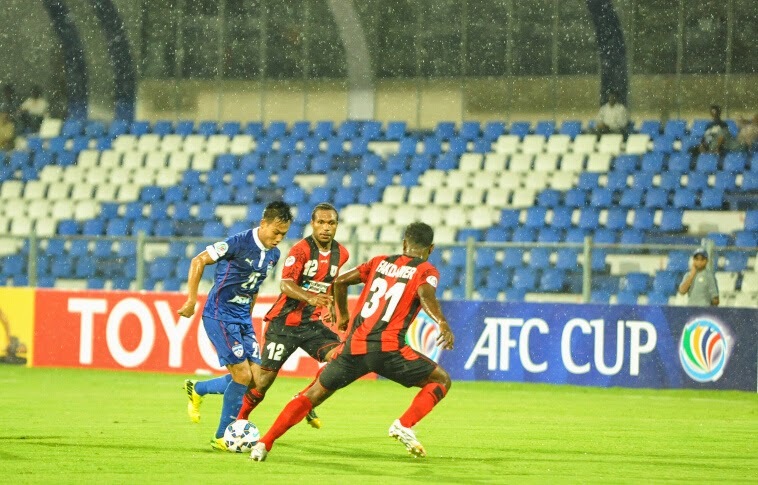 The second half saw Persipura attack with more purpose and it was another long ranger that got them the lead. A few yards outside the box, Wanggai took a couple of touches before finding target with his left foot. Westwood threw in Chhetri, CK Vineeth and Lyngdoh in a bid to make a game out of it but the visitors sealed the win with a close-range header from Solossa in the 77th minute. The defeat meant Bengaluru will have to make the trip to Hong Kong on May 26 where they face Group G winners South China AA in the single-leg Round-of-16 clash.